While bread pudding is often thought of as a dessert, I think it also makes a great breakfast. And while not very common, you can make bread pudding in muffin form. Just think, cubes of bread soaked in a rich cinnamon flavored custard. I usually tuck some small pieces of apple and some plump raisins into each muffin cup. Dust the tops of the baked muffins with some powdered sugar and enjoy this delicious treat. Bo Friberg tells us in his book Professional Pastry Chef that in centuries past, it was very common in England for every kitchen to have a bowl sitting on the counter to collect leftover bread. Once the bowl was full it would be used to make a rich and creamy bread pudding. Isn't that a great idea instead of throwing all those scraps of stale bread away. And if you don't feel like making a bread pudding, you could always freeze the bread cubes for when you do want to make this recipe. What makes a bread pudding perfect everyday fare is that it does not use fancy ingredients; just bread, milk, cream, sugar, eggs, and some flavoring (like vanilla and cinnamon). For these muffins I like to use a bread that won't break down easily. That is, it's sturdy enough to hold up to the custard. And my preference is to leave the crust on the bread as I love how it gets nice and crunchy when baked. 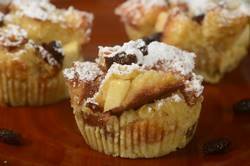 Bread Pudding Muffins: Preheat your oven to 325 degrees F (165 degrees C). Place the oven rack in the center of the oven. Butter or line 12 muffin cups with paper liners. Custard: In your electric stand mixer, fitted with the paddle attachment (or with a hand mixer), beat the eggs and sugar until slightly thick (about one minute). Beat or stir in the rest of the ingredients. Add the bread cubes and gently push down the bread cubes into the custard. Let stand for about 10-15 minutes or until most of the custard has been absorbed into the bread. Place about 1/2 cup (60 grams) of the bread pudding into each muffin cup. If there is any custard leftover in the bowl, spoon onto the muffins. If desired, put a few small pieces of apple and a few raisins into each muffin cup. Gently press the bread cubes to compact. Bake for about 20 -- 25 minutes, or until set and a toothpick inserted into the center of a muffin comes out clean. Place on a wire rack to cool. If desired, dust the tops of the muffins with confectioners (icing or powdered) sugar before serving. Leftovers can be stored in the refrigerator and reheated.